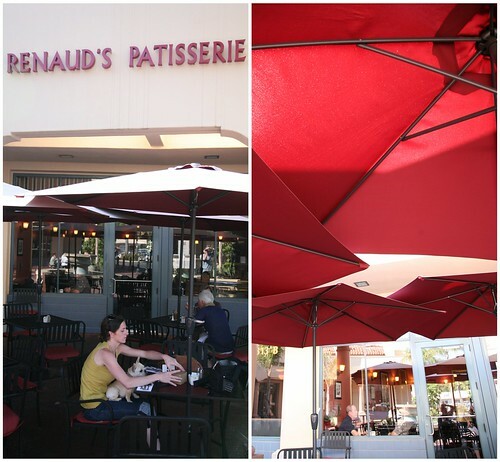 On the trip back from San Diego to San Francisco, our 2nd attempt at Le Tour de Pastry, I was very excited to arrive at Renaud's Patisserie & Bistro (Santa Barbara, CA) enjoy some lovely lunch and sweets on the patio in Loreta Plaza. 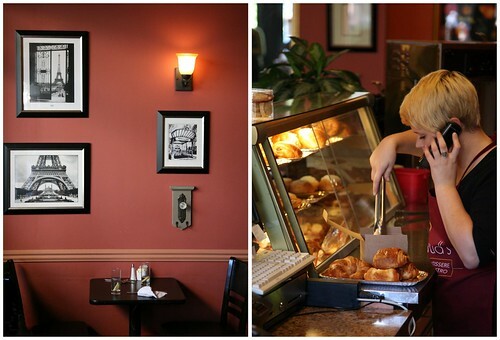 The inside of the bistro was so cute. Of course, outside was better for including Georgia in on the fun. The Pastry Chef, Renaud, clearly has extraordinary talent. He worked at the Ritz in Paris. Kind of a big deal. What are these little things? 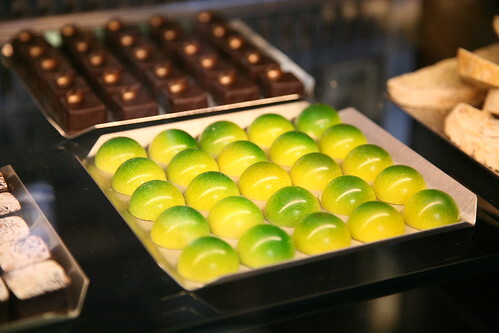 Some sort of Chocolate Truffle with a candy shell? Anyone know? 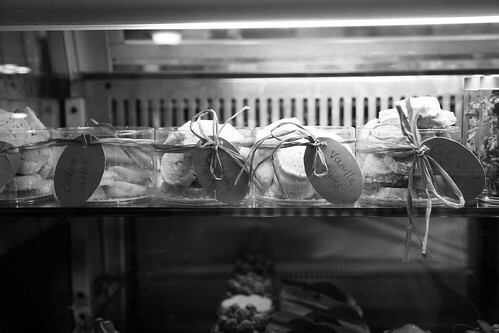 An array of Sables, or French Butter Cookies. More delicacies. 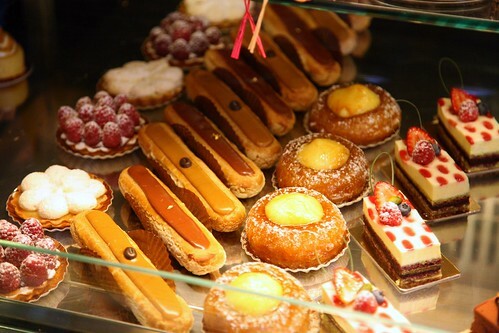 coconut-lemon and raspberry-almond cream tarts, chocolate and café éclairs, rum baba, and some other petite gateaux with strawberries. I ordered the Renaud's Salad. "Organic mixed greens with Dijon mustard dressing, grilled chicken, tomatoes, aged Gruyere cheese and a hard-boiled egg. Served with toasted garlic baguette." Yummy dressing. 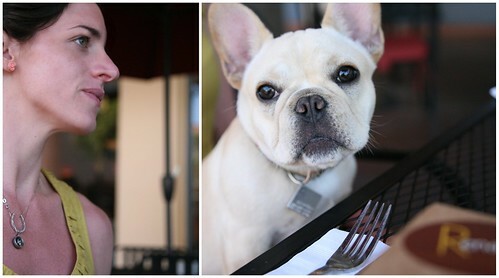 I ordered Cole [another] Croque Monsieur with ham. "Béchamel sauce, Swiss cheese and choice of ham or sautéed mushrooms on homemade pain de mie." One word: BUTTER. But in the good way. Like the "omg, how is this so good?" way. For dessert, I ordered one of each french macaroon (or macaron): chocolate, caramel (dulce de leche), coffee, coconut, pistachio, raspberry. 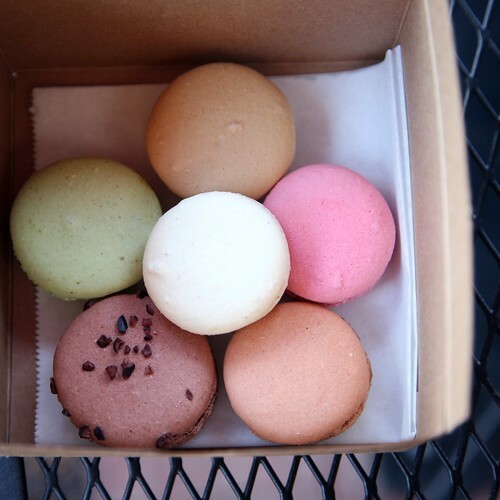 The macarons were absolutely perfect. They had a thin shell that crumbles into itself when you take a bite. Once your teeth have broken the shell, the chewy meringue pillow catches your fall and the taste of the delicate, sweet syrup center makes you go "mmmm". 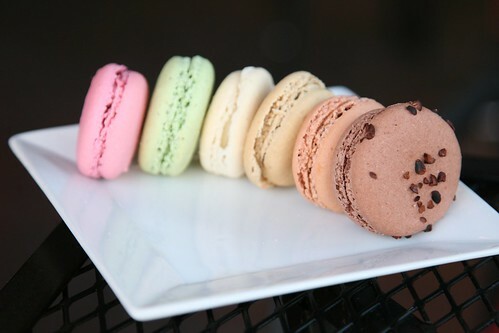 I can't wait to try and make macarons myself. I finally understand the craze!